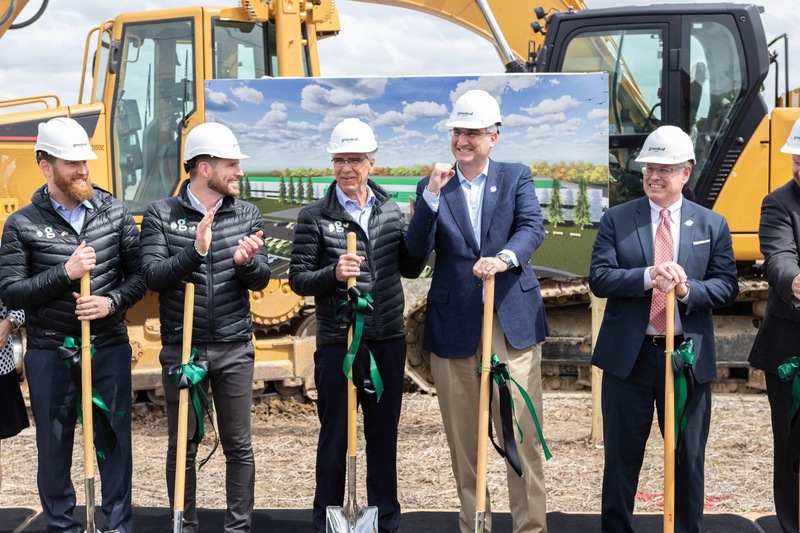 SHELBYVILLE, Ind.–(BUSINESS WIRE)–Apr 8, 2019–Greenleaf Foods, SPC (the “Company”), today announced plans to construct North America’s largest plant-based protein manufacturing facility in Shelbyville, Indiana. The 230,000-square-foot facility will more than double the Company’s production capacity to meet the surging consumer demand for its portfolio of brands, including Lightlife® and Field Roast Grain Meat Co™, the #1 and #2 brands in the refrigerated alternative protein category. The U.S. $310 million Shelbyville facility, slated to become operational in late 2020, will create 460 jobs on the 57-acre property and can be expanded to meet future market growth. The new facility will extend the Company’s network of production facilities, which includes facilities in Seattle, Washington, and Turners Falls, Massachusetts. In addition, the Company plans to invest in equipment to increase capacity and scale production at its existing facilities. The new Shelbyville facility will enable the Company to meet rapidly rising demand for plant-based proteins by supporting its innovation pipeline across its brands. In January, the Lightlife Burger, Ground, Italian Sausage and Bratwurst Sausage were launched as part of a new pea protein-based product line that delivers the sensory experience and taste consumers crave, marking the brand’s most significant innovation launch in its 40-year history. The new line will be among the products made at the new facility, along with other bestselling products from the Lightlife and Field Roast Grain Meat Co brands. The North American plant-based protein market had estimated sales of US$1 billion in 2018 and demand for plant-based protein continues to show strong growth . Fresh refrigerated products represent approximately 24% of the total market and delivered 40% sales growth in 2018. While burgers are fueling category growth, all refrigerated products are forecasted to deliver double-digit growth for the next twenty years. To mark this momentous announcement, Indiana Governor Eric Holcomb, Secretary of Commerce Jim Schellinger and Shelbyville Mayor Tom DeBaun are set to join the Company’s President Dan Curtin at a groundbreaking on the site at the intersection of I-74 and Highway 44, Monday, April 8 at 2 p.m. EST. Representatives of the Indiana Economic Development Corporation and Shelby County Development Corporation will also be present. Greenleaf Foods, SPC is a wholly-owned, independent subsidiary of Maple Leaf Foods Inc. (TSX:MFI) based in Mississauga, Ontario, Canada. For more information about the Company, visit greenleaffoods.com. This release contains forward-looking statements based on the Company’s current expectations relating its strategies; the anticipated technical capabilities of the new facility; value creation opportunities and other benefits from the projects; consumer tastes, preferences and buying patterns; project execution variables such as engineering, design and construction costs, schedule and approvals; availability of resources and labor necessary for the construction and operation of the facilities; and other factors. As these forward-looking statements depend upon future events, actual outcomes may differ and there can be no assurance that the results or developments anticipated by the Company will be realized. The Company does not intend to, and the Company disclaims any obligation to, update any forward-looking statements whether as a result of new information, future events or otherwise, except as required by law. Greenleaf Foods, SPC is committed to shaping the future of plant-based foods. Established in 2018, the Company’s portfolio of leading plant-based protein brands includes Lightlife® and Field Roast Grain Meat Co.™. The Company is headquartered in Chicago, and is a wholly-owned, independent subsidiary of Maple Leaf Foods Inc. (TSX:MFI).